I am on the way back from another Staff Ride with my students to Gettysburg. 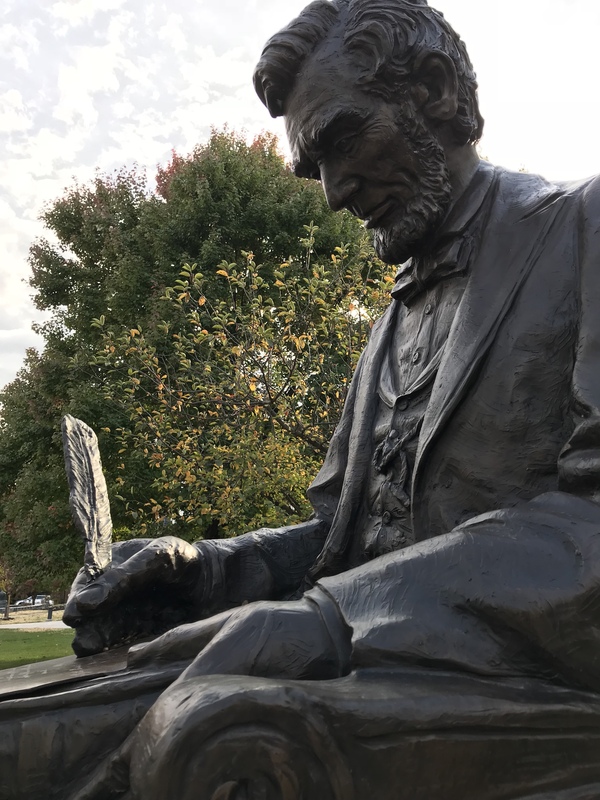 For me the place is incredibly important, when I go it is not just a trip back into history, it is an intensely spiritual trip, especially when I visit the National Soldier’s Cemetery where Abraham Lincoln delivered the Gettysburg Address. For me, like Lincoln, this is hallowed ground, and a place from which I always recommit myself to the unfinished work of the New Birth of Freedom, a work that has all too often suffered due to those who for whatever reason, be it racial, economic or political are willingly to work against freedom and equality. The message of the address takes us back to those words of the Declaration of Independence, that all men are created equal and endowed with certain unalienable rights; among them life liberty and the pursuit of happiness. The following is a chapter of my Gettysburg text which deals with that event and that speech. I am always humbled when I travel to Gettysburg. 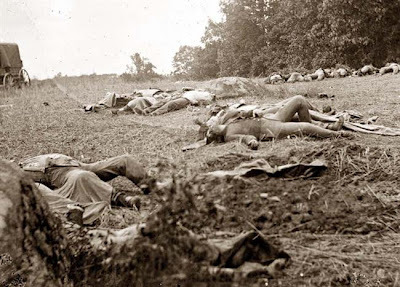 It is hard to believe in that now peaceful pastoral setting that over 157,000 Americans, almost 82,000 Union and 75,000 Confederate met in a three day battle. In those three days over 28,000 Confederates and 23,000 Union soldiers were killed, wounded, missing or captured. It was the greatest number of casualties inflicted in one battle on American soil in history. The places that the battle was fought have become legendary, for they are “hallowed ground” as President Abraham Lincoln so eloquently put it. The places, McPherson’s and Herr’s Ridge, Seminary Ridge, the Railroad Cut, Barlow’s Knoll, Cemetery Hill, Culp’s Hill, The Wheat Field, Devil’s Den, the Peach Orchard, Little Round Top, Cemetery Ridge, the Apse of Trees, the Angle and the High Water Mark are in a sense holy, or hallowed, consecrated by those who struggled there, those who lived and those who gave the last full measure of devotion to their country. When I take my students there I always finish at the Soldier’s Cemetery where Abraham Lincoln delivered the Gettysburg Address. I think about those men of both sides, fully convinced of the rightness of their cause who fought valiantly in the struggle. That being said when I go there though my family predominantly fought for the Confederacy my heart is drawn to those men who remained loyal to the Union and those who answered the call of Abraham Lincoln to serve in a cause greater than their own interests, the great and the small alike. On November 19th 1863 Lincoln delivered a “few words” at Gettysburg which were in all practical aspects a benediction at the dedication of the battlefield cemetery. 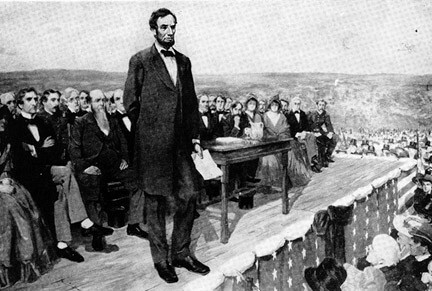 Lincoln was the second speaker at the ceremony following former Pennsylvania Congressman Edward Everett who spoke for more than two hours, a typical speech from the period. The speech is short, but its eloquence is unmatched. Lincoln wrapped ideas, concepts and ideals that men have written volumes about into a speech so powerful that many have memorized it. But few realize the context that it must be placed. Though the Union had defeated Lee’s Army at Gettysburg and Grant had taken Vicksburg to cut the Confederacy in half the North was growing war weary. During the fall of 1863 after a series of inconclusive battles in northern Virginia both Lee and Meade’s armies had sent significant numbers of troops to the west, to support operations in eastern Tennessee. There was a faction in the North, the Copperheads, who were willing even after Gettysburg and Vicksburg to end the war on terms favorable to the Confederacy, even allowing for Confederate independence and the continuation of slavery. They “clamored for negotiations with the Confederacy to restore the Union on the basis of status quo antebellum and, until the closing months of the war charged that as long as the antislavery party remained in power the restoration of the Union could not be achieved.”  They believed that the war was a failure and that military action could not be achieved by force of arms. It is also important to understand how Lincoln’s address at Gettysburg is reflective of the various intellectual and philosophical movements of the time. Even the location of the cemetery and the burial plots within it was significant. A Gettysburg lawyer, David Wills proposed to “Governor Andrew Curtain of Pennsylvania the establishment of a soldiers’ cemetery where the Union dead could be reburied with dignity and honor.”  The place was then outside the city, a plot of 17 acres purchased by Wills adjacent to the existing town cemetery on Cemetery Hill. That was significant culturally, for the Gettysburg Cemetery was part of a movement called the Rural Cemetery movement. The movement was part of the Greek revival in the United States and connected with the Transcendentalist movement. But, in a larger sense, we cannot dedicate — we can not consecrate — we can not hallow — this ground. The brave men, living and dead, who struggled here, have consecrated it, far above our poor power to add or detract. The world will little note, nor long remember what we say here, but it can never forget what they did here. It is for us the living, rather, to be dedicated here to the unfinished work which they who fought here have thus far so nobly advanced. It is rather for us to be here dedicated to the great task remaining before us — that from these honored dead we take increased devotion to that cause for which they gave the last full measure of devotion — that we here highly resolve that these dead shall not have died in vain — that this nation, under God, shall have a new birth of freedom — and that government of the people, by the people, for the people, shall not perish from the earth. Dr. Guelzo is quite correct. Many people in this country and around the world are having grave doubts about our democracy. I wonder myself, but I am an optimist. I do believe that we will recover because for the life of me I see no nation anywhere else with our resiliency and ability to overcome the stupidity of politicians, pundits and preachers. Now I for one do not think that we are currently living up to the ideals enunciated by Lincoln that day at Gettysburg. I can understand the cynicism disillusionment of Americans as well as those around the world who have for over 200 years looked to us and our system as a “city set on a hill.” That being said, when I read these words and walk that hallowed ground I am again a believer. I believe that we can realize the ideal, even in our lifetime should we desire. Friends of Padre Steve’s World. Yesterday we celebrated the 239th anniversary of American independence and the revolutionary document we know as the Declaration of Independence. I wrote about that yesterday and discussed the context of it as well as the contradiction to it posed by the institution of slavery. I talked about Abraham Lincoln and how for him the Declaration was the real heart of the American nation. In Novwmber of 1863 after nearly three years of bloody Civil War and about 10 months following the Emancipation Proclamation, Lincoln was invited to say a few words at the dedication of the Soldeirs Cemetary at Gettysburg. 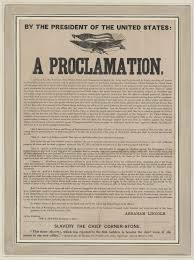 In those few words Lincoln redefined forever the concept of Liberty found in the Declaration, he universalized it. Though of practice of it often falls short, it is the high bar for which we must strive. If we do not we will return to the days when freedom was only for the few, and sadly there are many on the political right who not only believe that Liberty is reserved for the few but labor incessantly to prevent people from the full excercuse of the rights of citizenship and wherever possible to roll them back. I am always humbled when I travel to Gettysburg as I about to do again early next month. It is hard to believe in that now peaceful pastoral setting that over 157,000 Americans, almost 82,000 Union and 75,000 Confederates met in a three-day battle. In those three days over 28,000 Confederates and 23,000 Union soldiers were killed, wounded, missing or captured. It was the greatest number of casualties inflicted in one battle on American soil in history. The places that the battle was fought have become legendary, for they are “hallowed ground” as President Abraham Lincoln so eloquently put it. 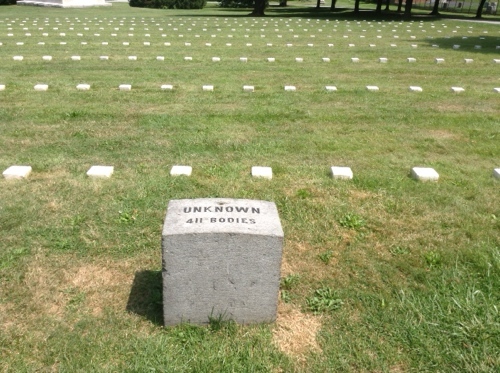 The places, McPherson’s and Herr’s Ridge, Seminary Ridge, the Railroad Cut, Barlow’s Knoll, Cemetery Hill, Culp’s Hill, The Wheat Field, Devil’s Den, the Peach Orchard, Little Round Top, Cemetery Ridge, the Apse of Trees, the Angle and the High Water Mark are in a sense holy, or hallowed ground. Those who struggled there, those who lived and those who gave the last full measure of devotion to their country consecrated them more than any of us could ever do. When I take my students there I always finish at the Soldier’s Cemetery where Abraham Lincoln delivered the Gettysburg Address. I think about those men of both sides, fully convinced of the rightness of their cause who fought valiantly in the struggle. That being said when I go to Gettysburg my heart, my mind and my soul are with the men who remained loyal to the Union and those who answered the call of Abraham Lincoln to serve in a cause greater than their own interests, the great and the small alike. This is despite the fact that my family predominantly fought for the Confederacy. On this weekend which we call the “President’s Day Weekend” I think it is appropriate to remember Abraham Lincoln and the Gettysburg Address. This is the last chapter of my Gettysburg text and since Lincoln is most closely connected with Emancipation and the End of Slavery I think that it is important to pause and remember his brief remarks at the dedication of the Gettysburg Soldier’s Cemetery. Those remarks are really important because they draw us back to the real source document of who we are as Americans, the Declaration of Independence. 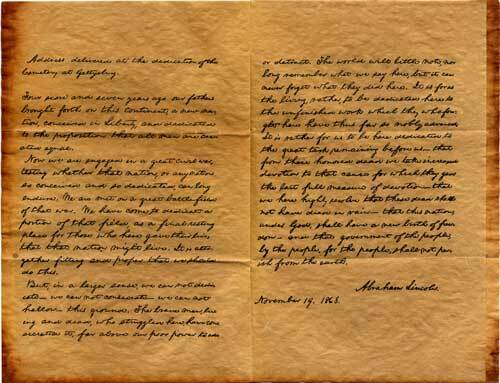 That document made the incredibly bold, and even revolutionary statement, that “all men are created equal.” Lincoln expanded those words to their logical end, that indeed all men, not just white landowners, were created equal. It is a concept that some in our country still struggle to accept. In a couple of weeks I will be going back to Gettysburg again with a group of my students. The last stop on our “staff ride” is the Soldier’s cemetery. 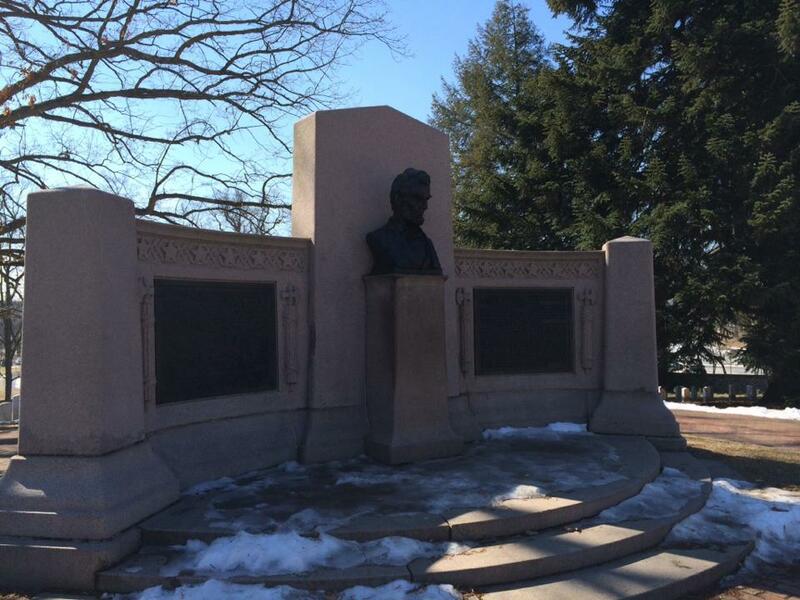 We go to the spot where it is believed that Lincoln gave his remarks and I take a few minutes to read his address. Have a great weekend and remember that freedom always comes with a price, and that the struggle for freedom, equality and justice has not ended. 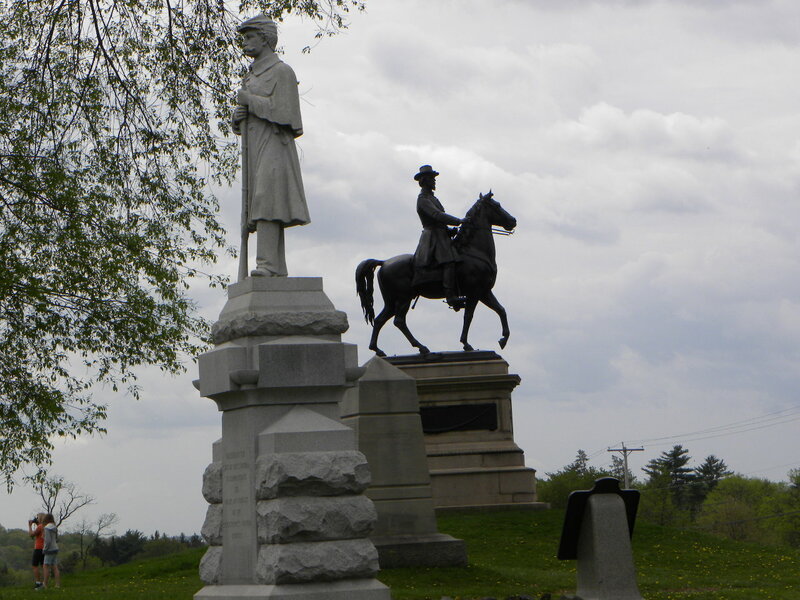 I am always humbled when I travel to Gettysburg as I will again in a couple of weeks. It is hard to believe in that now peaceful pastoral setting that over 157,000 Americans, almost 82,000 Union and 75,000 Confederate met in a three day battle. In those three days over 28,000 Confederates and 23,000 Union soldiers were killed, wounded, missing or captured. It was the greatest number of casualties inflicted in one battle on American soil in history. I am always humbled when I travel to Gettysburg as I did a week and a half ago. It is hard to believe in that now peaceful pastoral setting that over 157,000 Americans, almost 82,000 Union and 75,000 Confederate met in a three day battle. In those three days over 28,000 Confederates and 23,000 Union soldiers were killed, wounded, missing or captured. It was the greatest number of casualties inflicted in one battle on American soil in history. There was a faction in the North, the Copperheads, who were willing even after Gettysburg and Vicksburg to end the war on terms favorable to the Confederacy, even allowing for Confederate independence and the continuation of slavery. The efforts of the Copperheads to gain governorships in Ohio and Pennsylvania met defeat in November 1863, although their efforts would persist through the 1864 Presidential election. The amazing thing was that in spite of everything the Union survived. Lincoln was a big part of that but it was the men who left lives of comfort and security like Joshua Chamberlain and so many others who brought about that victory. Throughout the war, even to the end Southern political leaders failed to understand that Union men would fight and die for an ideal, something greater than themselves, the preservation of the Union and the freedom of an enslaved race. For those men that volunteered to serve, the war was not about personal gain, loot or land, it was about something greater. It was about freedom.